WILLEMSTAD - Public Prosecutors in charge of youth from Sint Maarten, BES and Curaçao met on Thursday and Friday in Willemstad. The meeting was coordinated and hosted by the Attorney-general. The meeting was an initiative of the Public Prosecutor’s Office Sin Maarten and was to realize a cross- pollinanization between the islands on the terrain of youth. The meeting was a good moment for the Prosecutors to give a presentation regarding their portfolio and problems they confront in their daily work regarding the youth. The Prosecutor’s visited on Friday the education institute Feffik and the Sociaal Vormings Traject (SVT) at the marinebase at Suffisant. 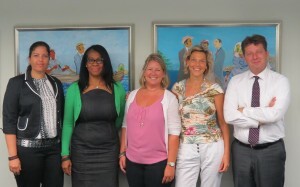 There they received some insight in the progress and details about the Sociale Vormings Plicht (SVP) on Curaçao. The meeting was a big success. All present agreed that they will be working closer together to learn from each other’s cases. The Publiic Prosecutors Office of Sint Maarten, the BES-islands and Curaçao have made youth crime and the prevention of this one of the spearheads and will attend with this topic with partners within and outside of the justice-chain. On the picture Prosecutor’s Ludmila Vicento (Curaçao), Marleen Overmeer (BES-islands), Karola van Nie (Sint Maarten) flanked by Attorney-general Guus Schram and advisor Anouk Swakhoven.